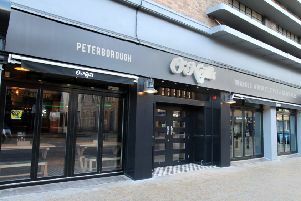 In 2011 Nando’s was heralded as the first of the big names attracted to Peterborough city centre following the refurbishment of Cathedral Square. Three years on it has been followed by the likes of Wildwood and Carluccio’s and will soon have near neighbours in Argo Lounge and Bill’s. So it seemed like the right time to see how Nando’s was facing up to the competition - that and the fact it is probably the only place in Peterborough I have never eaten. I have, of course, eaten in a Nando’s elsewhere so I was aware of the concept and their take on Afro-Portuguese fast food - predominantly flame-grilled chicken in spicy chilli sauce. The restaurant itself looks great from the outside with its darkened glass frontage, and does have great views over the square - particularly as we were greeted by the Christmas tree and lights in all their glory as we departed. Inside it is quite rustic and industrial - high ceiling, bare wood on one wall, exposed blockwork on the other with a big open kitchen. It was busy - it always is - but our 10-minute wait turned out to be only five minutes - by which time we had appraised ourselves of the menu. We were shown to a table and the staff member explained the process - pick your chicken, pick your sauce ranging from plain-ish to very hot - and pay at the till. Simple. I started with chicken wings - and went for medium hot which was more than enough for me. The portion was three fleshy bits of chicken that just begged to be picked up and gnawed at. Fresh off the grill they were hot and very tasty, but left me with sticky fingers and just a napkin to attempt to clean them up. I stayed medium hot with my main course but went with a prego steak roll - a beef steak basted with garlic and Peri-Peri, served in a Portuguese Roll with fries. The meat was nicely cooked with more than a hint of garlic and the bun - not unlike a ciabatta - was enjoyable too. As a meal, nothing special but perfectly acceptable. Donna had her half chicken cooked in hot sauce – and it was too. A nice succulent piece of meat on the bone that was oozing with the hot sauce, which she had accompanied by corn on the cob, which was a little dry, and a surprisingly delightful serving of macho peas - whole peas drenched in pea mash, parsley, mint and chilli. A refreshing Portuguese lager for me to wash it down, a dry white wine for Donna, and the bill just broke the £30 barrier. Service is quick, but doesn’t leave you feeling rushed, the food is hot and freshly cooked just as you demand it and the friendly atmosphere makes it easy to see why young people seem to flock there in their droves.